While stability, paddle ease and maneuverability are the core design elements of any SUP, each individual model achieves a unique combination of these and other attributes. The end result are specialized boards for specific individuals and uses. To better Determine the best choice for you, we have outlined some of the terms and features that we use to describe each of the SUP's designs we offer. The Deck: Generally flat, higher performance boards will be domed to decrease volume and create tapered(thinner) rail on the edge. Rails: Thicker rails provide stability. Tapered rails allow the board to be submerged when turning for better performance. Volume: More volume means more buoyancy, but how the volume is distributed defines the stability of the board. High volume boards with significant surface area are the most stable boards. The Tail: When riding waves, SUP surfers will move to the tail to pivot and turn. The thickness, shape and edge on the tail all define how easy the board turns. 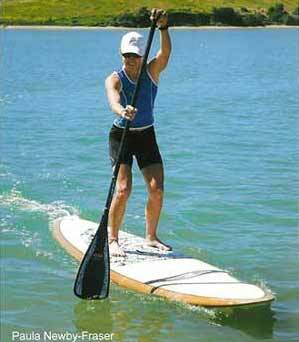 The Bottom: Flat Boards are the most stable, but many SUP's have some bottom contours such as concaves and vee, to allow for greater maneuverability and better planning on different surface conditions. Rocker: Boards have significant upwards curve(rocker) in the nose and some in the tail. The greater nose rocker, the easier to deal with the curve of the wave or chop. Tail rocker improves the ease of turning the board. Flatter boards plane faster over the water. Fin Setup: SUP's generally come with one of two options for fin set up. A single fin set up offers a slot for one large fin. A "Thruster" setup offers a middle slot as well as side slots for smaller fins. Single fins are associated with holding a more direct line, thrusters offer more maneuverability. 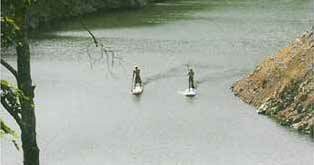 Handles: SUP's are big and sometimes difficult to carry. We have built in handles in the deck to allow our boards to be carried under the arm. If you are only planning on riding waves, consider the higher performance designs. The more confident you are as a surfer the smaller you can go in size. Surfers ride SUP's in waves of all size and conditions. Larger flatter or higher volume templates allow the rider to catch waves with greater ease, but require more leverage and force to perform turns and other tricks. Smaller templates require more balance, but turn easier. Boards with extra rocker help surfers avoid pearling (the nose submerging) when dripping in on steeper waves. Look for low rocker, high volume boards. In lakes and other smooth surface conditions paddlers can easily balance on mid sized boards, but in rougher water conditions, a large board makes balancing significantly easier. Proper SUP paddling offers an incredible full body workout. Combining balance with resistance, SUP paddling offers different approaches depending on the individual interests of the athlete. Proper technique allows users to isolate specific muscle for training or just obtain a serious overall cardio work out.